There isn’t a diet left you haven’t tried. You’ve seen doctors, alternative practitioners, MDs, NDs, and everything in between. You’ve tried herbals, antibiotics, antibiotics & anti-fungals, spent more than you’d like to remember on probiotics, prokinetics, and gut-healing supplements. The underlying causes has been found and you’ve been tested and retested. It feels like you’ve tried EVERYTHING to treat your Small Intestine Bacterial Overgrowth. So why aren’t you completely better yet? If you’re not thinking about your mindset during the SIBO and IBS healing process, you’re doing yourself a huge disservice! I’ve heard over and over again from hundreds of practitioners that the key to healing SIBO is in the patient’s mindset. “There are studies that I know of that have used gut-centered hypnotherapy for IBS symptoms with over 70% ongoing response rate improvement. So that’s tremendous for me. How do we explain that when we’re saying it’s all due to the bacteria? 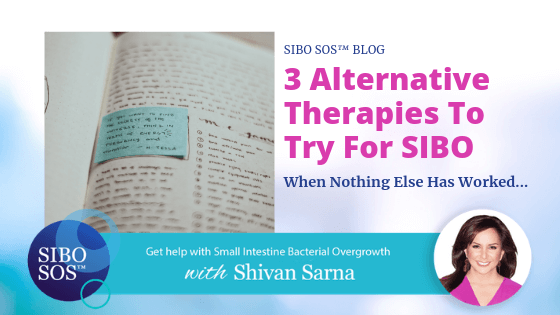 I think there’s so much that you have to consider when it comes to SIBO. We need to really start thinking about other things besides always bacteria. I lecture practitioners about this all the time. It’s not about that all the time. I have patients that are in extreme stress. And their symptoms improve when they actually start to really address that. And when Dr. Jacobi says “deep,” she means dig deeper than you’ve ever dug before. If you’ve done a lot of work, it’s easy to go, “But I’ve already done that.” Believe me, I’m speaking about myself and to myself when I remind you of this! I know you always hear “work on your mindset!” but it can be hard to know how to put that into action. Something that has been transformative for me is meditation. A great place to start with meditation is the Headspace App which guides you through short meditations. Visceral manipulation is a kind of manual therapy performed by a physical therapist on the fascia, which is the connective tissues between and the skin and the muscles. It’s really strong and stretchy and holds everything in place. It’s part of what holds us all together. At one appointment, she was palpating around my stomach. It hurt a little bit more. Usually, it doesn’t hurt. None of her work seems to really hurt, which is fantastic. She described how it felt like my fascia was tight and dry. She said this would explain my left shoulder blade pain and the compressed feeling I felt in my psoas muscle. I had adhesions there from a car accident almost 30 years ago! Adhesions are like scar tissue inside the body that cause tissues and organs to “stick” together. They can disrupt motility and are a common cause of SIBO. Adhesions are common after surgeries and from trauma like car accidents. Since we’ve released that, holy smokes, I feel like I can breathe! If you can’t breathe, and it doesn’t feel good, then it is a big deal. And I just felt shockingly, totally transformed! “Visceral manipulation, in order to help with the mobility of the organs and the abdomen, meaning, their ability to move with respect to each other, move around each other, as well as motility, to move things through the lumen or the inside of the tube [is very important]. Especially bringing the stomach down back into the abdomen and keeping it there, and keeping that lower esophageal sphincter in line with the diaphragm, so they can work together. That’s really important. That’s really effective. Fascia is a much ignored part of the body that has multiple functions. I’m trained in structural integration, so I’m intimately involved with the fascia. It’s amazing what can change so fast when you relieve an adhesion in the fascia, so that you don’t have a little spot weld anymore, can open up, and things can move and be as long as they’re supposed to be, instead of being all shrunken up like that. You can learn more and find a visceral manipulation therapist in your area here. One other thing to consider is Clear Passage – a technique (different from visceral manipulation) that can clear adhesions. More info on that here. Immunoglobulin therapy (aka IGG therapy) is something I’ve been hearing about more and more. It pops up as a topic frequently in our Facebook group and other Facebook communities for people with SIBO and IBS. These treatments work by binding to and deactivating toxins and microbes in the gut. This reduces inflammation and immune response so that the gut lining had a chance to heal. It can even help improve nutrient absorption. Dr. Michael Ruscio, DC is one of the leaders in the movement toward developing IGG therapies. he explained it to me as not a replacement for other treatments, but an “add-on” that can help tough cases finally turn the corner and start feeling better. “I don’t think that there’s one treatment that’s going to be the best at preventing relapse [of SIBO and IBS]. But rather, it’s important to look at this more broadly in terms of figuring out the combination of environmental factors that will allow your gut to remain improved in the longer term. It’s not just one antimicrobial knock, one elemental knock that’s going to fix everything. But rather, how do we cultivate? I’m so excited about the possibility with this therapy! And I know you are too – that’s why on Saturday, March 23, 2019 Dr. Ruscio is meeting me over in our Private Facebook Group to give a little more information about the science behind immunoglobulin treatments and answer your questions about them. Mark your calendars for our Facebook Live! P.S. Not a member of our free private Facebook Group? You can either join (it’s free!) to access the video with Dr Ruscio – or hang tight and we’ll email you a replay you can watch without a Facebook account a few days after the live event. If we cannot attend will three be a replay? Yes, there will be a recording of Dr. Ruscio’s Live Facebook event emailed to those on our mailing list. I checked and you are on our mailing list, so you will get the email when the recording is available, typically, a few days after the live event. Thank you for your interest. I would also like the interview with Dr. Ruscio emailed to me. I am not on fb. Can I read and learn from the posts without joining ? Thanks for your interest. If you receive regular emails from us, you will be sent the recording after the live event. If you don’t, go to our sibosos.com and sign up for the free cookbook to get added to our list. Even if you are on the list, go get the FREE cookbook! There’s lots of resources on the site you may find helpful. I would like Dr Ruscio interview emailed to me please. Hi Janet! Allicin is an extract of garlic and it doesn’t contain the compounds that make some people bloat/get gas when they eat garlic. I would love to know the answer to that too! I just had a “bodywork ” session with a woman who is an MD from Bulgaria and is a certified Bodyworker and Massage Therapist. She has studied Barral and Upledger courses. She does visceral manipulation, cranial sacral therapy, myo-facial release., etc. It lasted for 1 1/2 hours and she was moving some of my fascia around. I seem to be having ileocecal valve syndrome, as Dr. Siebecker calls it in her Underlying Causes course, but she said my I/C valve wasn’t that bad, she thinks it is more of a problem in the mesentery area. She gave me “sessions” to do as homework until the next time we meet in 3 weeks to re-adjust the 5 valves in the digestive system. I was beginning to think this may all be kind of voo-do until you wrote about it Shivan. Thank you so much and thank you for quoting Dr. Sandberg Lewis. After one session, I cannot say I felt much better, except for one day, but I will now persist. Hypnosis, also very helpful with IBS! Here’s a question for Dr Ruscio. I heard him talking about the immunoglobulin therapy, a video suggested in your last blog I think. A few years ago, I had a blood test to check the immunoglobulin (IgG, IgA, IgM) and everything was in a normal range (9,88 for IgG, 1,05g/L for IgA and 0,85 for IgM). How does this blood test relate with what Dr Ruscio is talking about. Could the result indicate if Dr Ruscio’s therapy could help me or not? How is this therapy different from what they check with this blood test? Thanks in advance for explaining and clarifying these things. Great question, France. I’ve added it to the list of questions for Dr. Ruscio to answer during the live event on March 23rd at 4pm ET in our Facebook Group. Be sure to watch it live to hear the answer. How are the supplements Dr Ruscio is using different than what you would get taking colostrum? Hey Ben! Great question – we’re getting so many questions that we are going to have Dr. Ruscio do a Facebook Q&A about the product! It will be March 23 at 4 PM ET in our group here: https://www.facebook.com/groups/SIBOSOSVirtualSummit/. We hope you can join us.